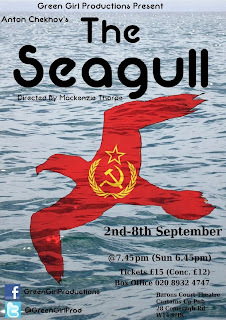 All credit to Green Girl Productions for having the theatrical guts and tenacity to rehearse what is generally a quality cast of actors through Chekhkov's The Seagull for a run that is merely a week long. That the production company are committed to mount this fringe production in front of what was a modest audience and probably for meagre financial reward speaks volumes for the commitment of these troupers to their art. Mackenzie Thorpe writes of setting his production as an allegory on the collapse of the Soviet Bloc in the early 1990s. Whilst Thorpe's intentions are noble his allegory fails as the production seems resolutely (sometimes stolidly) rooted in a Chekhovian era, albeit with modern dress. Notwithstanding, Thorpe's take on the tragic tale is a fair portrayal of passions denied and jealousies burned. James Rose's Aberdonian Boris is perhaps the star of the night, with voice and movement demanding our attention. 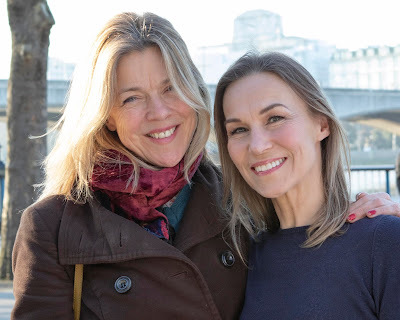 Newcomer Grace Lyons Hudson also puts in a consistently smashing and ultimately moving turn as Nina the fragile wannabe actress whose love for Boris is painfully scorned. Marysia Trembecka's Irina, a character who is yet another actress, is a distinctive performance though too often and too distractingly, one that suggests more of a Desiree Armfeldt, than may have been Thorpe's intention. Late in act 4, Nina speaks of the "agony of someone who goes through a play and knows how badly they are acting". Awkwardly, that sentence could apply to one or two of the men in this production though not it should be said, Patrick Osbourne's Constantine, who starts off wonderfully even if he struggles with the melodrama of his character's final scenes. The basement of this Barons Court venue proves to be as hot and steamy as the on stage passion so dress comfortably and take a bottle of water. Whilst the show teaches us little new about The Seagull, it does contain some moments of inspirational performance and interpretation. Strictly for the enthusiasts.